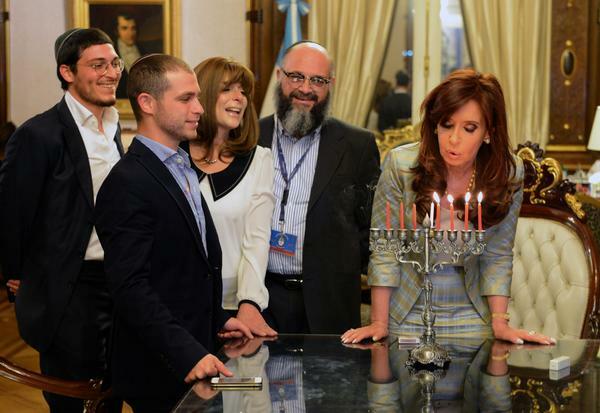 Argentinean President Cristina Fernández de Kirchner officially became the godmother of a Jewish boy last Tuesday. But the reasons behind the ceremonial act have gotten blurred with folklore about werewolves in South America. It was reported that the adoption was connected to an ancient legend or myth where the seventh son born after six boys becomes a werewolf. Turns out, there's a custom involving Argentina's President taking god children, and a myth about werewolves, and other than involving seventh sons, they are unrelated, according to a report in the Guardian Monday. According to Argentinian custom, the country's president takes the seventh child of Argentine families as a godchild. The honor only applied to Catholic children before 2009. According to reports, Kirchner took Yair Tawil as a godson after his parents were initially denied in their request in 1993. He appealed and last week became the first Jewish god son of the country's president. Earlier reports, including one in UPI, explained that according to Argentinian legend, the seventh son in a daughter-less family will turn into a werewolf ("el lobison") on his 13th birthday. "The legend became so feared that families would abandon or kill their sons," the UPI story stated. "To counteract this stigma, the president of Argentina began in 1907 to adopt one of the boys as their godson." But Argentine historian Daniel Balmaceda told the Guardian that the two traditions aren't actually linked. "The local myth of the lobizón is not in any way connected to the custom that began over 100 years ago by which every seventh son (or seventh daughter) born in Argentina becomes godchild to the president," he explained. According to Balmaceda, the later custom was actually started in the early 1900s by German and Russian emigres who brought the tradition to Argentina from Europe. The custom became official law in 1974, unrelated to werewolves.